Today is the big day! Are you ready to see the October Release?? And... are you ready for the chance to win all THREE sets? All winners will be announced tomorrow, October 1! or more during the month of October!!! Click below to hop - GOOD LUCK!!! Today is our last day of the October sneaks, but tomorrow all of the DT Members will be sharing amazing creations throughout Blogland!!! We will be giving away ALL THREE sets to one lucky stamper during our hop! So, make sure to head on back tomorrow!!! All the comments posted today are going into a random drawing and one of you will win the new October set - All Wrapped Up!!! You can have up to 2 entries! Please leave a SEPARATE COMMENT FOR EACH! Commenting closes at 9:30 pm TAWS time! Good luck! Good luck! All winners will be posted on October 1! Hi there, Tanja here with a Sneak Peek for the cuuute new stamp set All Wrapped Up! I guess this little bird has the funniest face expression ever. Hi it's N@ Ali. All Wrapped Up is a gorgeous seasonal set, I used the same sentiment as Tanja and a branch stamp to create my background. Lisa here, and your about to laugh because I too have used the same sentiment! hehehe! That's how cute it is! I have had a blast getting my paper piecing on when it came to this little guy, and I just now you are going to LOVE this set! It's Day two of our sneaks!! Woo hoo!!!! Don't forget to come back tomorrow for another sneak! And we have our New Release Hop this Tuesday, September 30 and we'll give away ALL THREE to one lucky stamper! All the comments posted today are going into a random drawing and one of you will win the new October set - Tickle Me Happy!!! You can have up to 2 entries! Please leave a SEPARATE COMMENT FOR EACH! Commenting closes at 9:30 pm TAWS time! Good luck! Good luck! All winners will be posted on October 1 during our Recap! Hi everyone!! Its Dana with a little sneak of the new Tickle Me Happy!! I love this stamp set!! At first i was going to make a holiday card.... but it didn't turn out that way (even though i used Christmas pattern paper!!!! Hehehe!! Hello! It's Tracy here with a card using the new Tickle Me Happy set. I am so excited for this set and will be using it many, many times! I stamped the feathers on vellum and colored one of them in with a Copic marker. Hey! 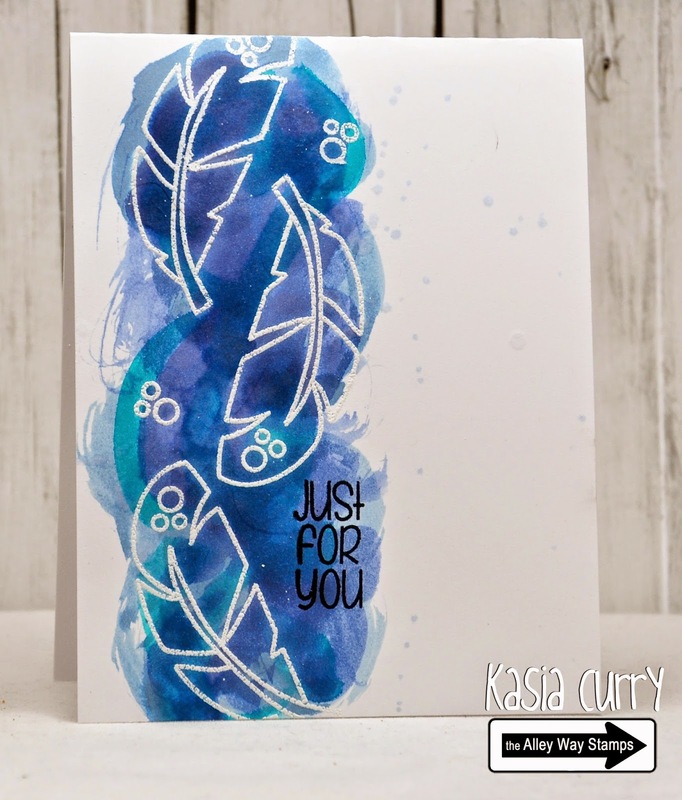 Kasia here with a "watercolour" card showcasing the amazing new set Tickle Me Happy. You are going to love this set!! Hey all, Jeni here with yet another little Tickle Me Happy card!! 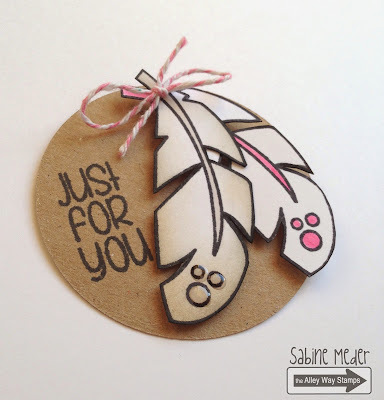 You are going to love these feathers!!! I can see many, many more cards from this set!! It's that time again already!!!!! We have our first Sneak Peek giveaway today! This year is flying by - it's almost October!!!! Don't forget to come back tomorrow for another sneak! And we have our New Release Hop Tuesday, September 30 and we'll give away ALL THREE new sets to one lucky stamper! All the comments posted today are going into a random drawing and one of you will win the new October set - Snow Daze!!! You can have up to 2 entries! Please leave a SEPARATE COMMENT FOR EACH! Commenting closes at 9:30 pm TAWS time! Good luck! All winners will be posted on October 1 during our Recap! Chrissie here. This set is so fantastic! I adore snowflakes and this set has multiple sizes! It's awesome! Hi, it's Christine. 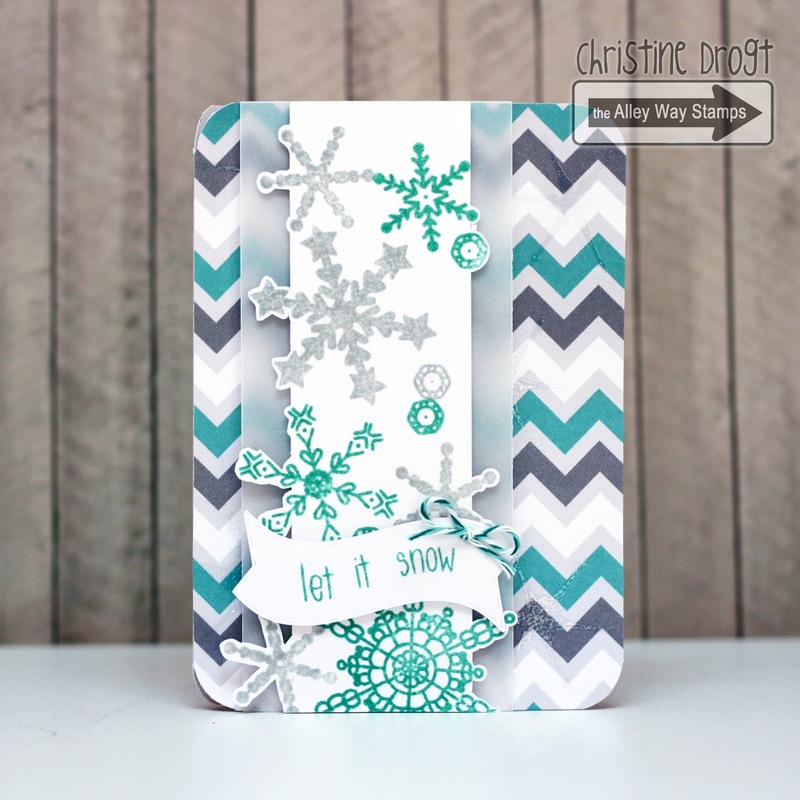 Snow Daze is a set fill of beautiful snowflakes - I just love it! I added a sentiment from Snow much fun. Anni here! I used the beautiful snowflakes to make some gift boxes for christmas! Hey everyone! So I have been totally into making DIY products for my crafting. Christine sent me some DIY glue dots and I knew I HAD to make some for myself. I also show you how to use your stamps by looking at them in a different way :) If you want to see more pictures, head over to my blog. Today we are sharing the last few creations from our two September Guest Designers. They have both been fantastic and have really inspired us all! Marina made an adorable birthday card AND made another video! YAY! She used Wish Big for this beauty! "The Alley Way Stamps has a lot of comical and cartoony looking stamps but I wanted to share with you that you can turn it into a nice watercolouring piece. This is just another way you could stretch your Alley Way stamps. With this no-line colouring technique, it gives an illusion that I've drawn the balloons myself hehe. But it's actually thanks to the Wish Big stamp set. Try it out! " We have the final two projects from Chitra to share today, too!!! YAY! 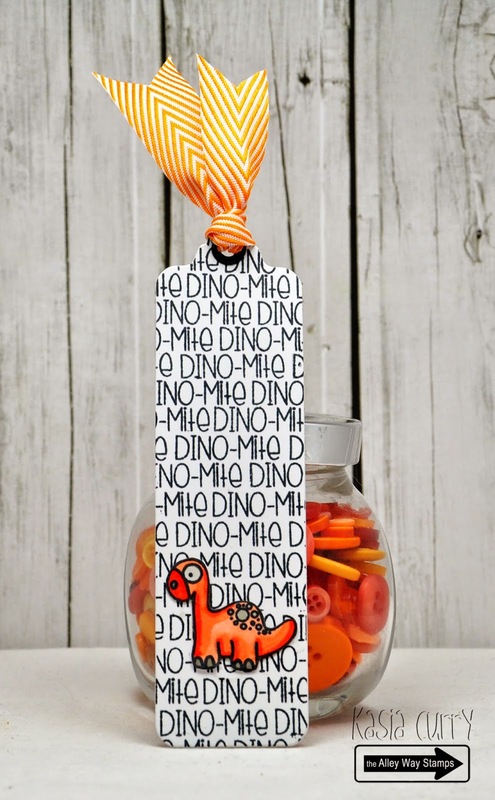 She used Monster Mash for these amazing candy bag toppers! I LOVE IT! She used Petal Pushers with some patterned paper to create this stunning creation. It really pops - WOW! Thank you to both Guest Designers - we've loved having you both with us this month!!! Hi Dana here!! I'm sharing another card featuring the September release!! 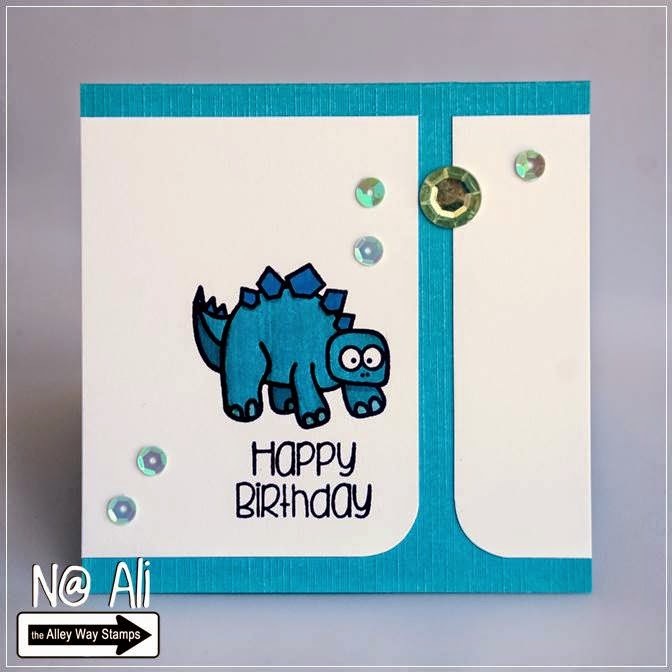 I just can't get enough of these cute dino cards!! Today i used Prehistoric, Stomper and Livin' Fossils. Hello there, Tanja here with my last dino card this month. Oh it was a wonderful time with all the cuties :-) I used Livin' Fossils, Stomper and Prehistoric. See you! 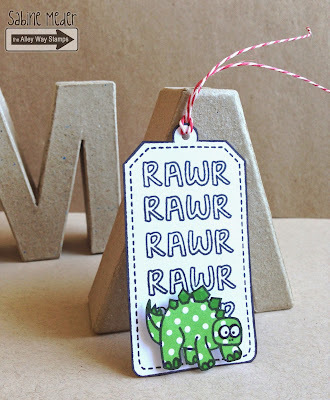 Perfect for every dinosaur lover! Hey Everyone! Vicky made another adorable TAWS video for us to enjoy! Hope you will check it out! Hi! Chrissie here! The weather is changing in the Chicagoland area and that has me thinking of Fall! I used the leaves from Livin' Fossils (yes, this set is SO versatile - it's not just the dinos that are cute!) and a sentiment from It's Fall About You! Hiya! Lisa here to share a cute little friendship card, that would be perfect for any childhood friend! 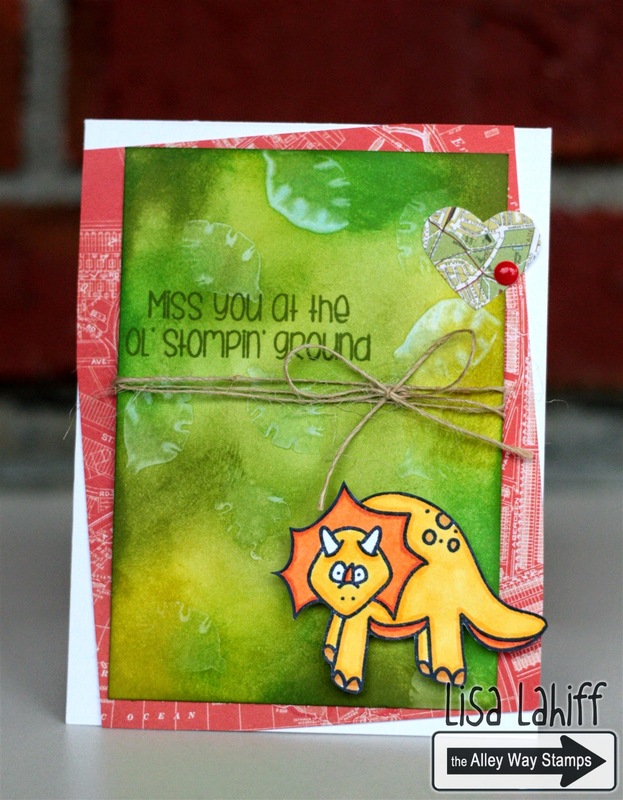 I've stamped my little baby friends from the Livin' Fossils Stamp Set and the little egss come from the Stomper Set. I die cut my image into a circle and finally added my sentiment from the Prehistoric Set! Wish Big!! Hey there! Jeni here with a bit of birthday cheer! It seems as though I never quite have enough birthday cards, and today this little number has hit the spot! 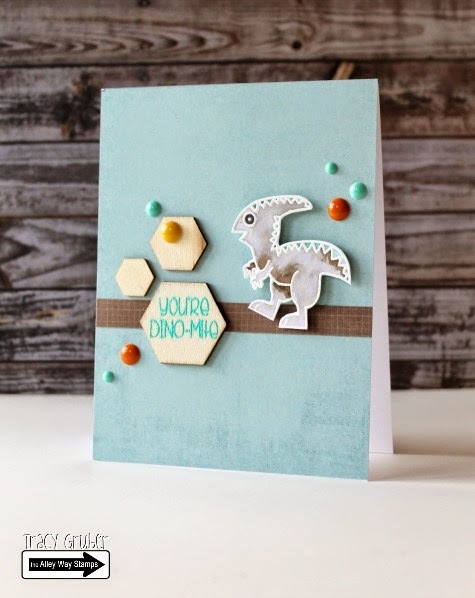 I love this cute dino and sentiment from the Livin' Fossils set! I love that the choice of marker makes these dinos feminine or masculine...perfect!! Hey stampers, Anni here! 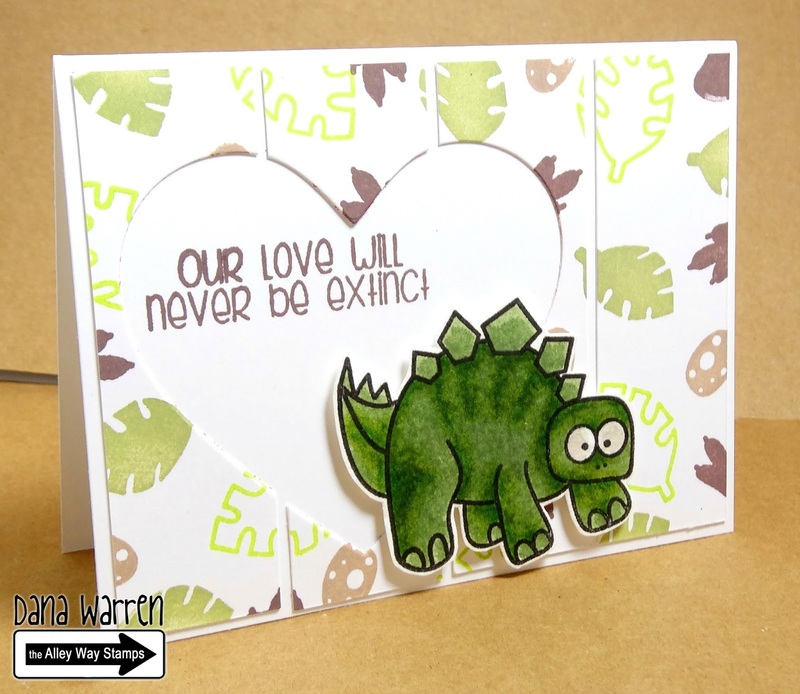 I have another dino card for you - aren't they cute! 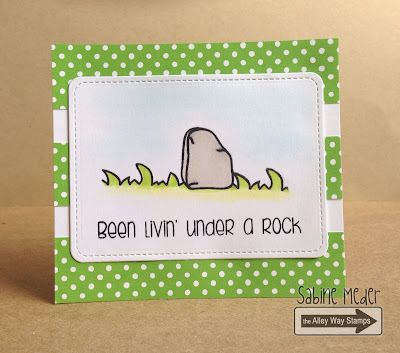 For this card I chose one from Livin' Fossils and added a sentiment from Rock Solid. Hi! Dana here!! Today i have a cute little card for you. I saw a challenge that had a photo prompt with apples, but the challenge was over so i moved on looking at other challenges. But i could get the idea of apples out of my head, so i just decided to do it and make a card featuring apples! I used Got It Covered (sentiment), Buggin Out (jar) and Tag Alongs (apples). Hey there! It's Tracy here with my dino-mite card! 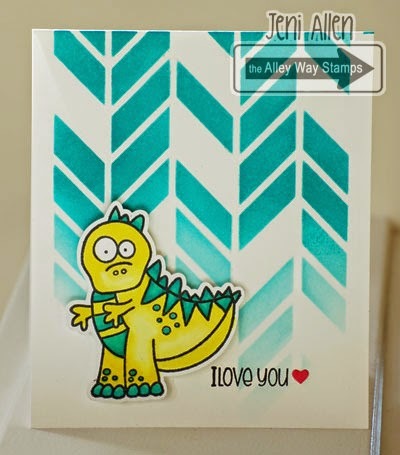 I stamped the dinosaur from the Livin' Fossil set with VersaMark ink and heat embossed it with white embossing powder. I then colored it in with Distress Markers and a water brush. The sentiment comes from the same stamp set. Hello, it's Sabine. I made a CAS card using Stomper (the rock) and Prehistoric (the sentiment). Hi! 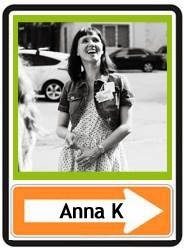 Anna's here to show you simple Happy birthday card. I used Rock Solid set for sentiment and a piece of paper and few sequins. Quickly and elegant! 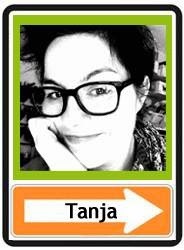 Hello everybody, Tanja here with a 'stampede of dinos' card. I used Livin' Fossils and the versatile Set Rock Solid. We're back with our fabulous September Guest Designer again today! Woo hoo! "I wanted to share that you don't need watercolour paper to do some simple and basic watercolouring. As you can see, I'm just using regular kraft paper. If you don't dilute it with so much water, you can make a vintage-looking watercoloured image. I hope you've been inspired to look through your The Alley Way stamp sets and mix them up. The Alphabet Soup stamp set is really handy to have so that you can create your very own sentiment. " 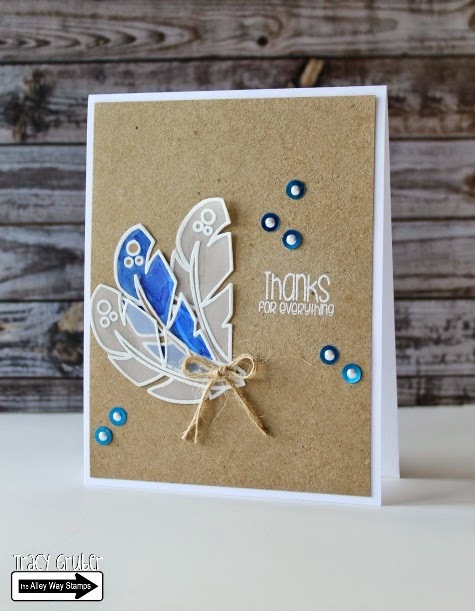 And here is her AMAZING video she created for this card: ENJOY! Hello! Again "Lava Your Smile" from Anna. Love this sentiment. Love this Dino. Love the heart on its thigh. Used Prehistoric and Livin' Fossil sets. Hey there! 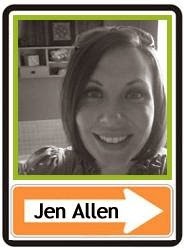 Jeni here with a bight number today! I whipped out my Stomper dinosaur and my copics...and a little bit of a stencil...oh the fun!! Good Morning! Kasia here, sharing a cute little bookmark I created using the Livin' Fossil set. Anni here with one of my all time favorite: Birds of a Feather. I thought this cute bird would go perfectly with this sentiment from Rock Solid. Hello! It's Lisa here with a missing you card that could be masculine or feminine! 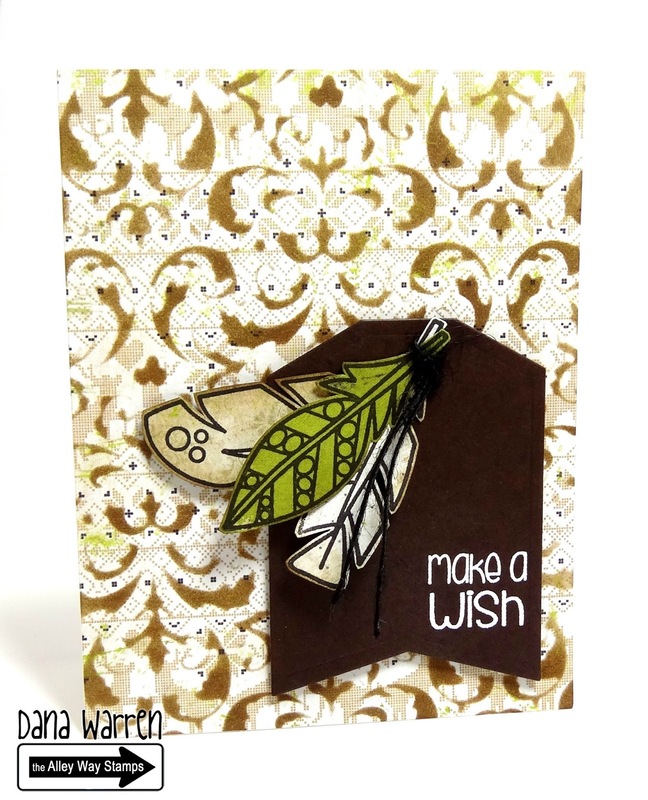 For this card I have created a ghost like leaft background by inking cardstock with destress inks and stamping the leaf image from the Stomper Stamp Set with water. I then stamped my little triceratops image from the Livin Fossils Set, colored and fussy cut before adhering to my card with foam adhesive. Hope you like it! Hey there!! 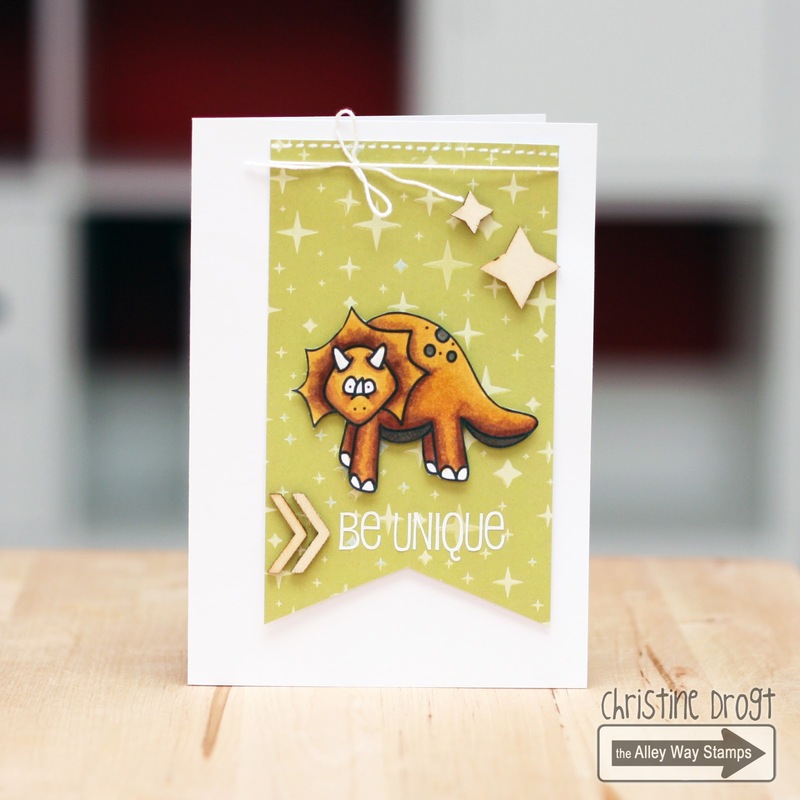 Jeni here with a fun little Livin' Fossil card!! 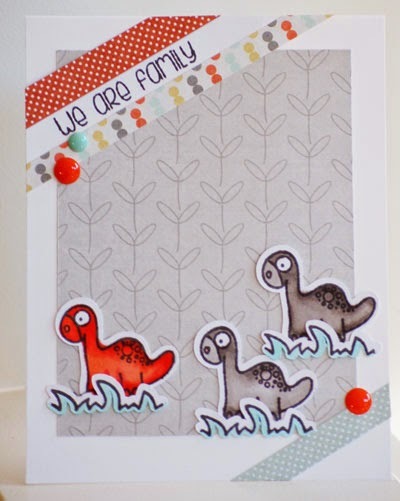 I love this little group of Dinos...makes my heart happy!! Aren't they cute little dinos!? This great sentiment is from Prehistoric! Happy Monday - with our cute dinos! More... From Our September Guest Designers!